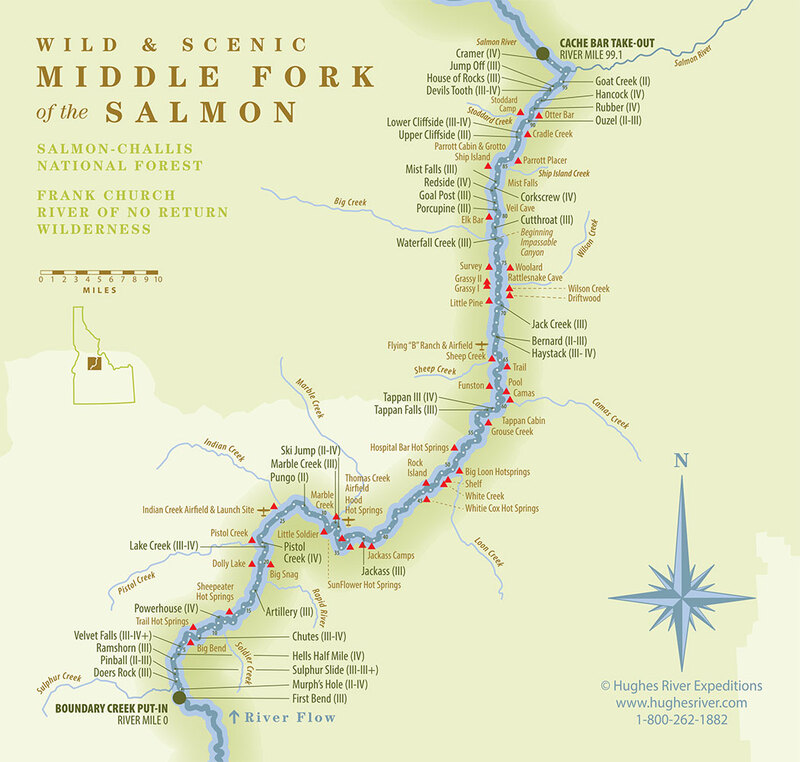 The Middle Fork of the Salmon is a “blue ribbon” Westslope Cutthroat Trout fishery. Fishing is normally good from mid to late June on and is best in late summer (late August and September). All fishing is catch and release. The crystal clear waters of the Middle Fork are home to wild westslope cutthroat trout, and the fly fishing is incredible. The river also supports a smaller number of rainbow trout, cut-bow hybrid trout, and the elusive and protected bull trout. Tributary streams add brook trout to the mix. We outfit four annual September trips on the Middle Fork, and they are great times to fly fish the river. 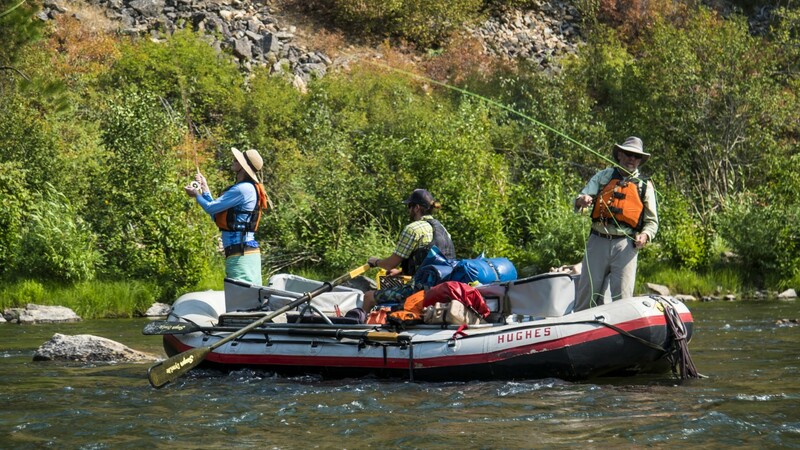 All our Middle Fork trips are outfitted for fishing. 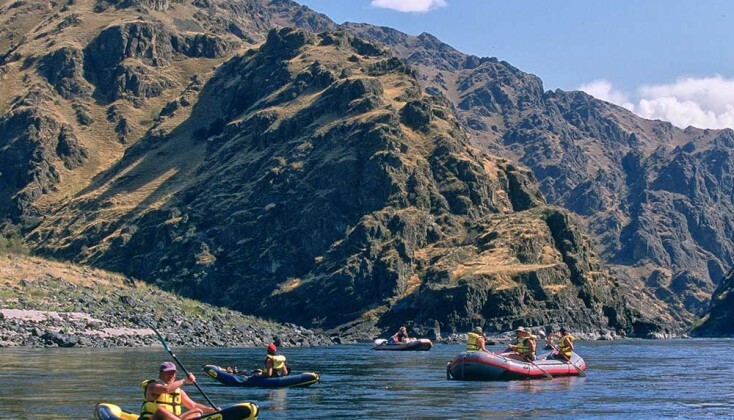 Many of our summer guests plan to include fly fishing as some part of their Middle Fork trip. Experienced fishermen usually prefer to bring their own gear. Fishing guides, pleased to provide instruction. 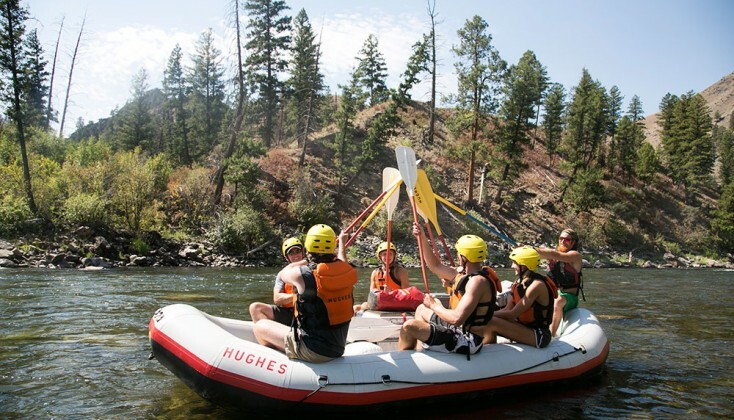 Hughes River Expeditions, Inc. guides deluxe fly fishing trips on the Middle Fork of the Salmon with expert guides. Serious fishermen can arrange “fishing boats” with 2 fishermen/boat & guide service. Hughes guides are happy to provide instruction, and we always have tackle boxes filled with local flies, leaders, fly & line dressing. Westslope “cuts” are beautiful with olive green to steel gray backs, and yellow/brown sides, with red/pink on the belly. Don’t forget their namesake, the bright orange slash on the lower jaw. Tributary fishing is an added treat. 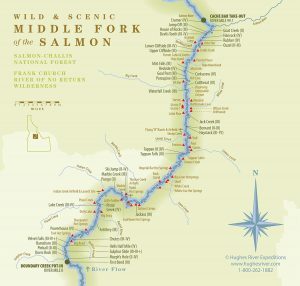 During your trip, we will stop to hike up tributaries (Loon, Camas, Big Creek). These brushy tribs offer some great fishing, but with little room to cast. 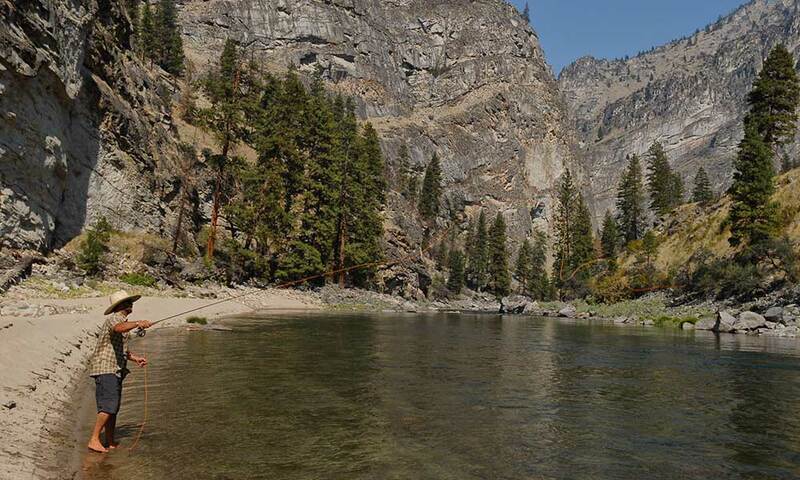 Bring a short fly rod, and enjoy these streams that are a great part of fishing the Middle Fork. 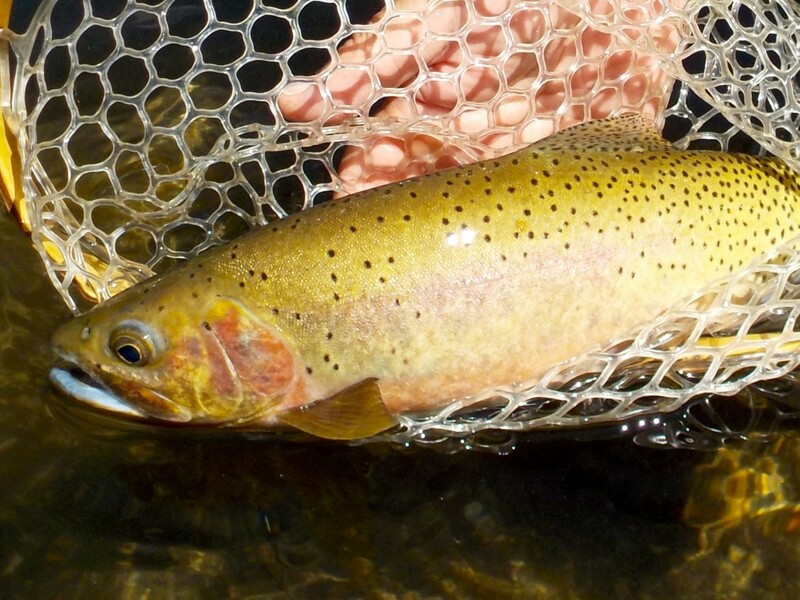 “Catch & release” also applies in the tributaries. The “wiley” westslope cut takes dry flies aggressively. We fish on the surface with large, easy to follow dry flies (Humpy, Stimulator, Sofa Pillow, Parachute Hopper, Buck-tailed Caddis). Westslope cutthroat are an indicator of excellent water quality, and watching them rise through gin clear water to take dry flies is thrilling. The Stonefly Hatch that occurs annually around mid June to early July, can be one of the fishing highlights of the season. The huge “Huey like” stoneflies hover over the Middle Fork and occasionally crash into the stream where they are a delicacy for westslope “cuts”. Mid-summer fishes very well. 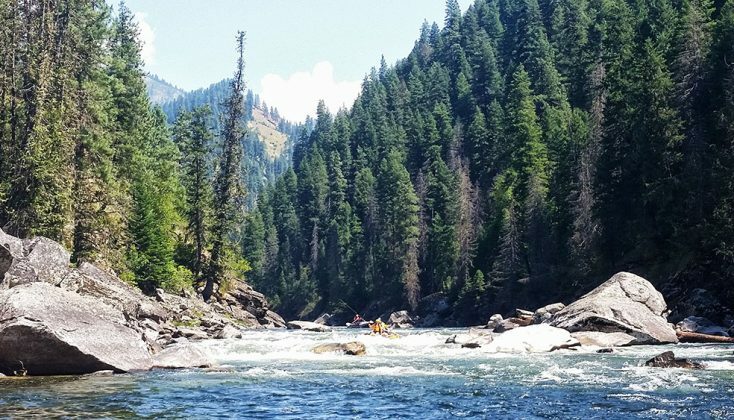 Also, a prime time to fish the Middle Fork is late summer and early fall when the water temps drop, and the fish become very aggressive as they lay on weight for the winter. The Stanley Fly Shop in Stanley has an excellent selection of Middle Fork flies & tackle. 208-774-3377. Early morning or late evening in low light, use wet patterns with a long leader. Add extra tippet to achieve a longer leader. Nymph fishermen should have imitations for mayflies, stoneflies, and caddisflies. Regulations are “catch & release” with barbless hooks. Hughes guides teach careful release to assure that this incredible fishery continues. 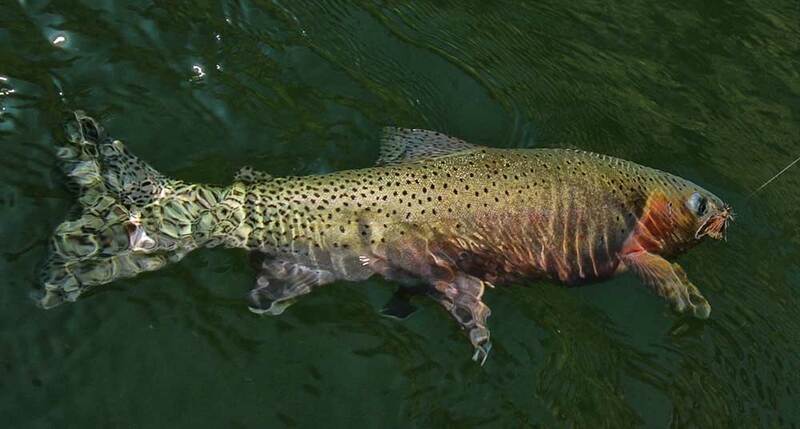 The westslope cutthroat’s low reproductive rates and aggressive nature make “catch & release” an excellent management choice for the Middle Fork. You can purchase license at pre-trip meeting at River One. You can also purchase an Idaho fishing license directly from Idaho Fish & Game Dept. (800-554-8685 OR fishandgame.idaho.gov) Cost is $15 for the 1st day, and $7/day for each additional day. Children under 14 can fish on a license of an adult parent.